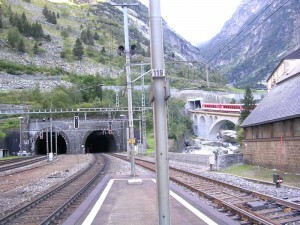 Caption: North end of Gotthard Tunnel; train to Andermatt climbs away to the right. Skiers have been following rails into the snowy mountains for 140 years now. 1868 was the year the Mt. Washington cog railway first hauled passengers to the summit. The cog railway didn’t run during the snowy months, because New Hampshire’s vicious weather made it dangerous to keep the tracks clear of snow. But that same spring, the first passenger train ran the route from Sacramento across Donner Pass into Truckee and on to Reno. The nine-hour trip cut 41 hours off Snowshoe Thompson’s best time. During the following winter, the train ran through snowy trenches dug out by hundreds of navvies and coolies. This was the heyday of long-board racing in the Sierra mining camps, and while we have no record of it, it would have been odd indeed if a Norwegian miner didn’t depart the train at Soda Springs or Donner Tunnel to ride his snowhoes down to Truckee. Thompson himself was probably one of them: during construction of the railroad, he’s known to have skied mail from the station at Cisco south to Meadow Lake, now a ghost town south of Kirkwood. By this time, French railway companies had begun to push eastward up the river valleys into Switzerland. In 1872, the Swiss engineer Lois Favre started work on an ambitious north-south route to link Lucerne with Chiasso on the Italian border. In 1882, steam trains ran through the nine-mile St. Gotthard Tunnel, at 3,800 feet elevation – a couple of thousand feet below the garrison town of Andermatt which had long guarded the pass. Served by its own cog railway from the main route, Andermatt soon became a winter resort. Mountain resorts needed their own railways. The most spectacular of these was the Jungfraubahn, opened to the 11,300-foot summit in 1912 – after 16 years of tunneling. In 1920, Switzerland had enough hydroelectric dams to electrify all these routes (can you imagine riding behind a steam locomotive through a nine-mile tunnel?). One side-benefit of a high-alpine dam is that its construction – and the maintenance of the head-pipe running down to the generating station – usually required a funicular (cable-drawn) railway. Ernest Hemingway’s 1924 short story Cross Country Snow – perhaps the first evocative description of the ski bum life – begins with a couple of American skiers jumping from the baggage car of a Swiss funicular train for a powder run back to the valley. The Canadian Pacific Railroad pushed across Rogers Pass in 1885, and Glacier National Park opened the following year. The railroad encouraged tourism, putting up alpine hotels and, in 1899, hiring the first of a team of Swiss guides who would help to pioneer alpine skiing throughout the region. Over a 35 year period, avalanches across the tracks killed 200 railway workers. In 1913 construction started on the five-mile Connaught Tunnel, and the surface tracks were abandoned. The 20th century brought true wintersport tourism to snowbound towns served by railways. In 1909, Charles McGlashan of Truckee founded the town’s annual Winter Carnival, designed to lure tourists from San Francisco. At Hilltop, a knob overlooking the train station on the southeast edge of town, organizers built a toboggan slide. In 1910 some local genius rigged a steam donkey (a steam-driven winch) to haul the sleds up the hill. Skiers rode the rope, too, and thus was born the world’s first mechanical ski lift. Unless you count the train itself. During the 1920s, as ski clubs grew, they rode trains into the Alps, the Laurentians, the Adirondacks, the Rockies, the Sierra. And when the Depression cut into railroad revenues, creative marketing men in New England and elsewhere hit upon the idea of special weekend excursion trains. According to John Allen (From Skisport to Skiing), the Boston & Maine ran its first ski train out of Boston to Warner, New Hampshire on Jan. 11, 1931, carrying 197 members of the AMC, Dartmouth Outing Club and Harvard Mountaineering Club. Over the course of the winter, the railroad ran 12 trains northward, carrying over 8,000 skier, experts and newcomers alike. Clerks and secretaries climbed aboard – many came not to ski but to party. Local innkeepers reopened for the winter weekends. In January, 1932, the Rio Grande Railway ran special trains from Salt Lake to Park City. After Alex Foster set up his first rope tow early in 1933, the ski train business boomed. The Boston & Maine hired ski instructors and put in a stock of rental skis, racked in the baggage car. In 1935 the New York, New Haven & Hartford sent trains north from Grand Central Station. Averell Harriman, president of the Union Pacific, took note and began dreaming up Sun Valley. By 1936, John Allen writes, 70,000 skiers rode trains out of New York in January, February and March alone. When the Colorado Ski Train glides out of Union Station at 7:15 a.m., its 14 heavy cars and 750 passengers are drawn by three 3,000 horsepower General Electric F40PH locomotives. Over the next two hours, the 16-cylinder diesel engines will turn at a constant 900 rpm as the train climbs 3,960 feet in 56 miles, to the Moffat Tunnel and Winter Park Station. That’s the basic numbers. Here’s another one: It’s been 97 years since Carl Howelsen and his buddy Angell Schmidt turned the Denver, Northwestern & Pacific Railway into a ski lift – and started a revolution in Rocky Mountain skiing. In 1902, Denver banker and railroad executive David Halliday Moffat, Jr. developed a plan for a six-mile tunnel under Rollins Pass. He pushed a temporary line over the pass, at 11,660 feet on Colorado’s Continental Divide. The Moffat Road would require a sizeable crew to shovel the tracks – in fact, 41% of the railroad’s expenses eventually went to snow-clearing – and so the company built a dormitory at the summit, dubbed the Corona Station. The DN&P business plan was to haul coal eastward from the Yampa Valley, and eventually to run the line out to Salt Lake City. In the meantime, Moffat’s main revenue stream came from tourism: He marketed the spectacular ride up Boulder Creek to the Top of the World, and expanded the Corona dormitory into a hotel. Within a year, Moffat was able to run his tourist traffic all the way to Hot Sulphur Springs, a spa town at 7,600 feet on the western slope. Hot Sulphur Springs had been developing as a mineral-baths resort since 1864. The railroad was a big deal for this town – it meant steady business right through the winter. To celebrate the opening of the line in September, 1905, a special excursion train carried 900 passengers over the top. In the fall of 1911, Swiss-born hotelier John Peyer decided to promote his winter business in Hot Sulphur Springs by organizing a Winter Carnival, complete with skating and sledding. He scheduled it for final weekend of the year. At 8 a.m. on Saturday, Dec. 30, 1911, a DN&P train pulled out of the North Denver station for the long climb to Corona. It carried a load of New Year’s Eve celebrants bound for the Peyer’s Winter Carnival. Among them was a Norwegian mason who happened to have been Holmenkollen combined champion in 1903 (and the 50k cross-country champ in 1902 and 1903). After helping to found the Norge Ski Club in Chicago, Carl Howelsen (originally Karl Hovelsen) had moved to Denver in search of some real snow. He found it. At noon, the train pulled into Corona Station. Howelsen and his friend Angell Schmidt climbed down, put on the their skis and began the long exhilarating run down the west slope of the Rockies. They descended 3,100 feet to Fraser, about 16 miles, following close to the railbed because of all the fallen timber in the woods. They then ran another 18 miles to Hot Sulphur Springs, the last four miles all downhill. They langlaufed into town at about 9 p.m., at the height of the party. The crowd was happy to see them. In the morning, they shoveled snow into a small ski jump on the hill behind Peyer’s house. Before the day was out, Peyer and his winter sports club were planning another carnival for February, and the Norwegian pros were invited back. Thereafter, the Hot Sulphur Springs Winter Sports Carnival was an annual event. Hundreds of Denverites rode special trains to the event. The following winter, Howelsen settled in Steamboat Springs and began teaching the local kids to ski and jump, and in 1914 Steamboat launched its own Winter Sports Carnival. Howelsen and his Norwegian friends were busy teaching skiing – and building jumps — from Denver north and westward to the end of the line in Craig. Top Norwegian jumpers like Ragnar Omtvedt and Anders Haugen traveled from the Upper Midwest to visit little Colorado towns and set records on their big jumps. The Winter Carnivals formed a circuit of ski racing and ski jumping events that could support a crew of athletes through most of the winter. As in the Midwest, a jumping meet was the occasion for most of a town’s population to climb on a train and follow their champions across a couple of counties. The train schedule was not dependable. Despite the huge budget thrown at snow removal, despite the adoption of steam-driven rotary plows, sometimes the weather simply shut the pass down for weeks at a time. Weather forced the railroad into bankruptcy in 1913, and again in 1917. The route was taken over by the Denver & Salt Lake Railroad, the D&SL. North American ski trains took a break for World War I, when Moffat Road locomotives were busy moving coal and oil for the war effort. Work began on the Moffat Tunnel, under the pass, in July, 1923, and the first freight train hauled 12 cars of lumber eastward on Feb. 24, 1928. The following morning, passenger train service began. During the intervening years, trains had usually been able to get over the top to Hot Sulphur Springs and Steamboat Springs for their Winter Carnivals. With the tunnel open, access was guaranteed, even as the Depression deepened. The winter carnival kicked off at 8:30 a.m. with a snow shoe race, followed by a three-legged race, then a novelty race – one ski and one snow shoe. Ski races, sled races and toboggan raced preceded a hockey game, figure skating and barrel jumping. There was even a skijoring jump with automobiles. The afternoon had an impressive line-up of nine ski jumping events on that part of Bungalow, Dean or Maggie Hill dubbed “Howelsen Hill,” concluding with with slalom and what was then called “down-mountain” races by Arlberg Club members. A week later the News ran a Pullman sleeper train overnight to the 23rd Annual Winter Sports Carnival at Steamboat. Before long, other businesses – the Denver Post, Montgomery Ward, Safeway Stores — ran trains to Aspen or Gunnison. And the News Snow Train became an annual event. Meanwhile, skiers could ride regularly-scheduled trains up to snow country on any winter day. The easiest trip, of course, was to the West Portal of the Moffat Tunnel – just two hours out of Denver. This was the site of the prosperous Fleming Bros. sawmill, which had produced all the railroad ties and shoring lumber for construction of the tunnel and approach track. The logging trails offered good skiing upward to timberline and the open bowls above. Members of Denver’s Arlberg Club had built a few private cabins and in 1933 cut the first dedicated downhill ski trail near the old Mary Jane mining claim. In 1937 George Cranmer, a club member and Denver’s manager of parks, talked the city into spending $30,000 on a rope tow. Winter Park opened as a municipal enterprise with a three-day carnival at the end of January, 1940, and of course a series of special trains hauled the celebrants. Meanwhile, in 1939 local skier Frank Bulkley had founded his Eskimo Ski Club and loaded up to 300 kids on the regular D&SL train to West Portal each weekend morning in winter. 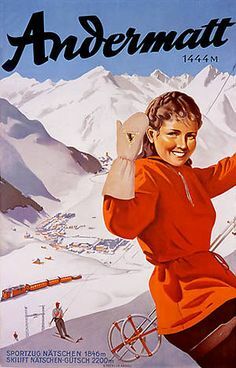 After World War II, skiing and ski trains resumed. Winter Park acquired four Army-surplus rope tows from Camp Hale, and built three Constam T-bars. The Denver & Salt Lake merged into the Denver & Rio Grande. In 1947, the new railroad entered into a 40-year partnership with the Eskimo Ski Club and Winter Park. Bulkley, along with Gordy Wren, launched the Winter Park Ski School. Bulkley showed the D&RG management how to set up special trains to handle hundreds of skiers, equipping baggage cars with ski racks, and providing one car with a snack bar. In the early days, kids paid $3 for the round trip. At its height in the mid-‘60s the train ran with 22 ancient cars, most of them built in 1915. This was the practical limit, because the cars were heated with steam lines from the locomotives, and that was about as far back as heat would carry. In theory the cars seated 80 each – that’s almost 1800 kids – but there wasn’t always room for everyone to sit. In a big winter, trains hauled as many as 30,000 passengers, most of them under 16. More or less unsupervised for the two-hour ride, some of the passengers grew obstreperous. Water-pistol fights were common, occasionally aided by the discharge of a fire extinguisher. A favorite stunt was to vandalize the lights so the car would go dark for the trip through the tunnel. Teenagers began smuggling booze aboard. The railroad resorted to putting three sheriff’s deputies aboard, but they couldn’t patrol 22 cars at once. A couple of generations of Denver kids learned to ski in the rowdy culture of the D&RG train, which may explain some of the doings at Colorado’s ski resorts (and in the ski industry) in the late ‘60s and early ‘70s. By the late ‘60s, like most railways around the country, the D&RG wanted out of the passenger business. Concerned about passenger safety and the vandalism of its cars, the railroad began scaling back the service. First they dropped the snack car, spurring dozens of young entrepreneurs to haul suitcases full of candy bars aboard for sale to their peers. Then the railroad terminated Sunday service, and finally reduced the string to just eight 70-year-old cars, limited to 30 mph because of their ancient trucks. Frank Bulkley fought for a few years to keep the ski train running. The gasoline shortage of the mid-70s gave the train a new lease on life, and the much-reduced ski train chugged on through another decade. But the Eskimo Ski Club relied on a fleet of buses to haul kids over Berthoud Pass. In 1983, what remained of the D&RG passenger service was absorbed into Amtrak. In November, 1984, the railroad was purchased by Philip Anschutz, a Denver-based billionaire who had made his money in oil, railroads, telecommunications and entertainment conglomerates. Anschutz had an instinctive love of trains and railroading. He saw in the ski train a chance to recreate an earlier era and culture. He sold the creaky old coaches to an outfit that ran wine trains in Napa Valley, and bought 17 lightweight, high-speed cars from Canada, where they’d served the Montreal-Toronto run. Anschutz had the Tempo cars fully refurbished and painted in the Rio Grande colors, gold and silver with black trim. Today the ski train, operated by Ansco vice president Craig Meis and general manager Jim Bain, is a luxurious experience, with three classes of service and elaborate dining facilities. For the 69th season of the Denver Ski Train, beginning Dec. 27, passengers will pay $59 in coach and $85 in the club car, with plush lounge seating. Corporate groups can reserve a deluxe observation car, parlor car or sleeper/dome car. It’s a long way from sharing your brown-bag lunch with 80 screaming 13-year-olds. Today, the D&RG Ski Train is unique in North America, the only dedicated train that delivers skiers directly to a ski hill. Out in California, a skier can still ride from Oakland to Truckee via Amtrak’s California Zephyr, and catch a cab up to Northstar, Squaw Valley or Alpine Meadows. For that matter, you could catch the Zephyr from Chicago and change at Denver’s Union Station for a regular Amtrak train that follows an hour behind the D&RG Ski Train. There’s still a ski train out of Boston to Wachusett (but the last few miles are by van). Japan still runs regular trains from Tokyo north to ski country, and the Glacier Express runs across most of the high country in Switzerland. The slickest modern ski train, for my money, is the 8-hour overnight Eurostar run from London’s Waterloo Station to Bourg St. Maurice, via the Channel Tunnel. From the Bourg station, passengers stroll directly onto the aerial tram for a 7-minute ride to Arc 1600 and the high-alpine skiing of the Tarentaise. This story is based largely on accounts by Steve Patterson and Kenton Forrest (The Ski Train), Leif Howelsen (The Flying Norseman), and John Allen (From Skisport to Skiing).